The Rebel Sweetheart. 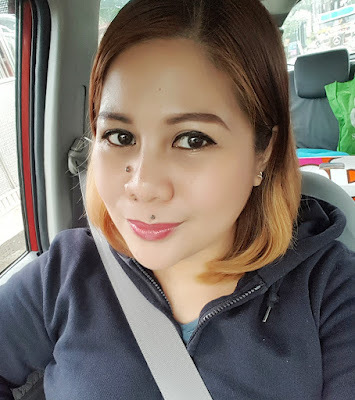 : Spotlight | Nature Republic Pure Shine Melting Tint. 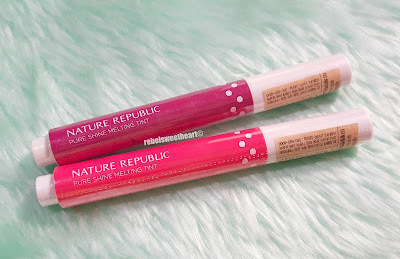 Spotlight | Nature Republic Pure Shine Melting Tint. Happy Holidays, everyone and hope you all had a wonderful Christmas! Ours was relatively quiet and uneventful, save for the traditional Noche Buena (Christmas Eve dinner) with my siblings at Mum's (our) house. Christmas Day was spent at home, since Yue's circumcision wound is still healing and he refuses to dress up properly and leave the house. Yes, I had him circumcised a few days before Christmas, earlier than we had originally planned, because of his recurrent UTI. That being said, here's another product review, which I had promised to do more of in my previous post. These are the Pure Shine Melting Tints from Nature Republic, which I bought simultaneously with the Pure Shine Mascara. 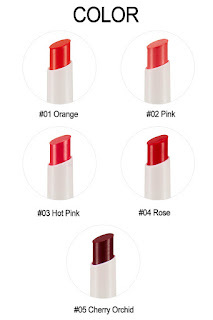 These tints were also on sale, and you know there's no chance in hell that I would pass up on 1+1 sale events, all the more if they're lip products. Nature Republic Pure Shine Melting Tint. The Pure Shine Melting Tints come in a cute, pen-type packaging. One thing I found really quirky about this product is the clicker at the bottom, which you need to press to get the product out. 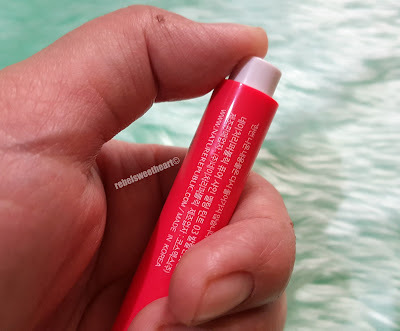 It took me awhile to figure this out while swatching the tints at home because the sales lady that assisted me during my purchase did not inform me about this 'clicker pen' concept, lol. Works like a clicker pen. 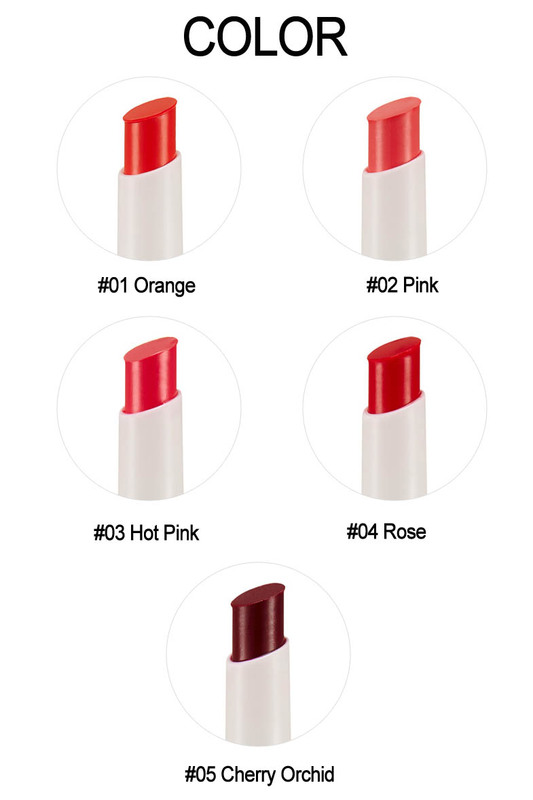 There are five shades in the Pure Shine Melting Tint line, as seen on the photo below. Shade options for the Nature Republic Pure Shine Melting Tint. However, only shades #01, #03, and #05 were in stock at the Nature Republic store that I went to. 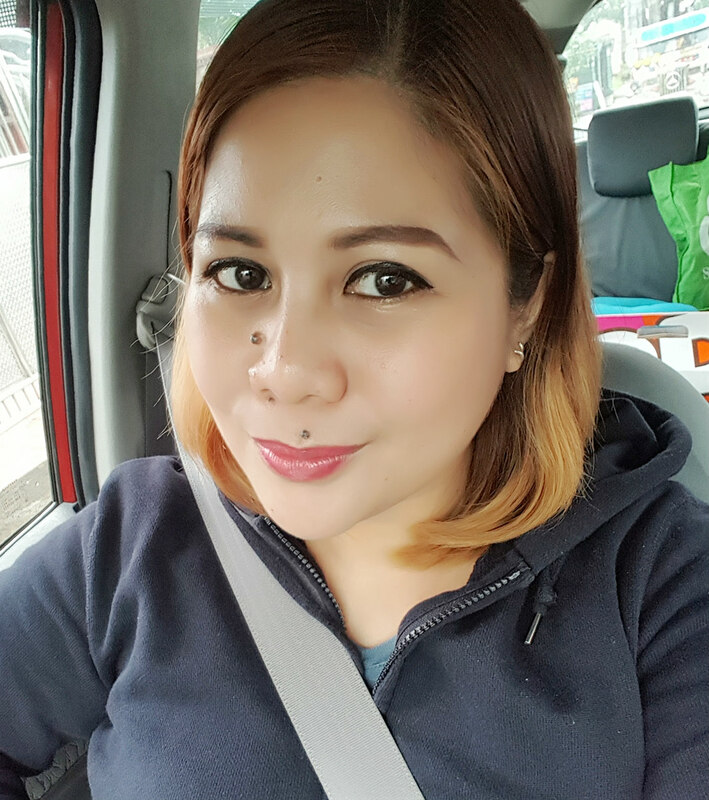 I'm not a huge fan of orange lip colors, so I didn't even consider buying shade #01. Shade number indicated on the seal. 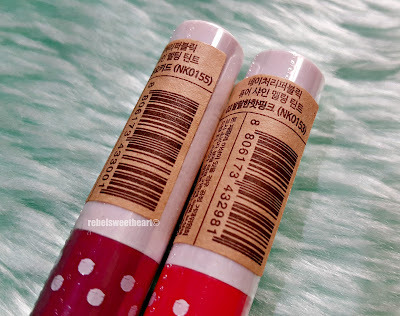 Shade number also indicated on the tube, along with product information written in Hangul. Shade #03 is a bright, vibrant shade of pink, while Shade #05 is a vivid reddish shade that straddles between pink and purple. Shade #03 Hot Pink on the left, #05 Cherry Orchid on the right. Shade #05 Cherry Orchid on the left, #03 Hot Pink on the right. Both shades are nicely pigmented, especially Cherry Orchid, which has a very solid color despite its semi-glossy finish. 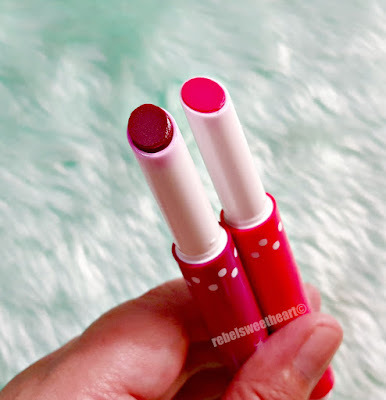 With one swipe, you get a sheer, rosy tint, and as you layer them on, you get a more vibrant and intense color that's somewhat comparable to a lipstick. The color stays put for about four hours or so before it starts to fade into a soft, rosy stain on your lips. 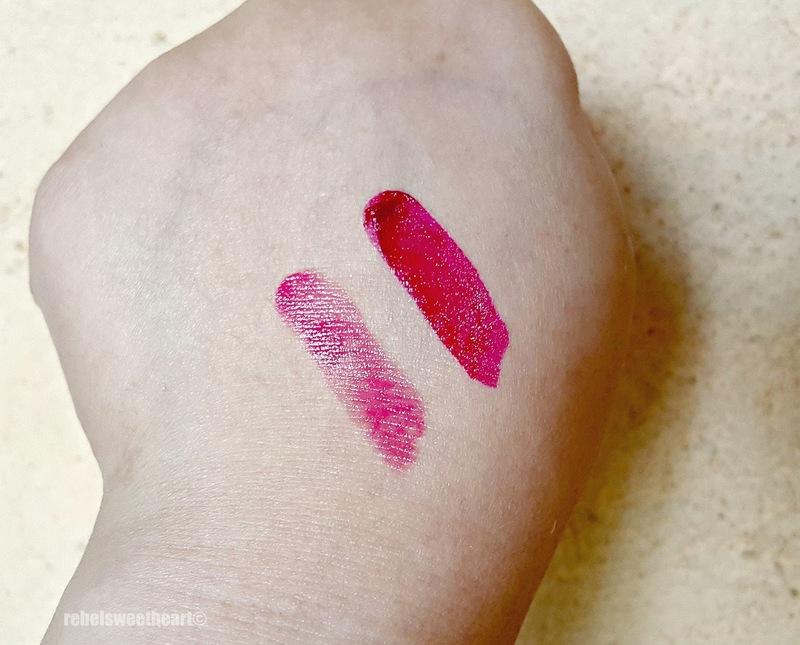 Swatched, indoor lighting - Hot Pink on the left, Cherry Orchid on the right. Swatched, natural light - Hot Pink on the left, Cherry Orchid on the right. 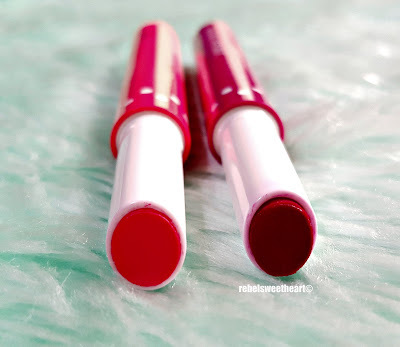 I especially love how these Pure Shine Melting Tints glide on smoothly without the sticky, oily feel, and how they make your lips feel soft and moisturized. They also have a soft, fruity scent akin to a grapefruit, which I find quite nice. The best part about this purchase? 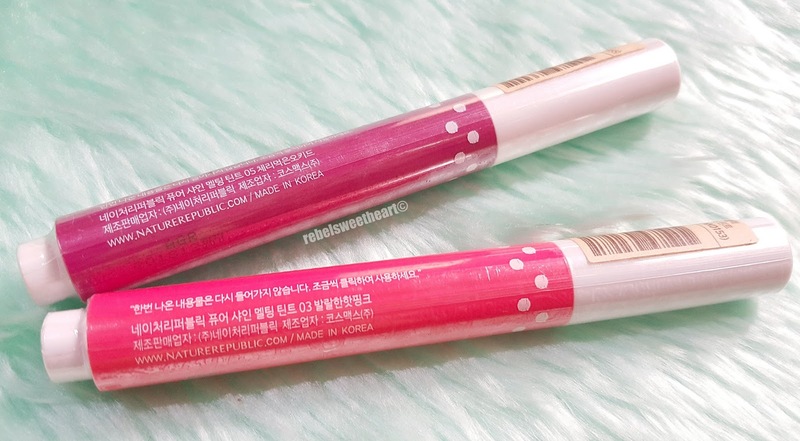 These Melting Tints are very affordable, even at its regular price of 5900 won (around Php 300 or $6). 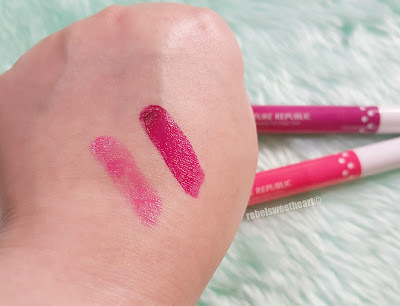 I got both tints for the price of one (remember, I'm a sucker for 1+1 promos), and yes, that's quite a steal for such a lovely lip product. Nature Republic Pure Shine Mascara - Volume. LIPS: Nature Republic Pure Shine Melting Tint in 03 Hot Pink. I like the colours, both of these look good...still have doubts about the clicker though, does it make the application easy? The colors are really pretty. They would be perfect for any occasion with a hint of color. I like this product! I must try it, it looks very awesome and I love the colors.